If 3D effects and visuals graphics are the only reason you want to go watch Wrath of the Titans, please save yourself the time and watch Lord of the Rings instead. If it’s the Greek mythology that intrigues you, however, I strongly suggest you rent Troy or even Disney’s Hercules. Basically, give this film a miss. I had an option of studying Greek Literature in college, and it all seemed so interesting with evil fathers, Oedipal sons and ostracized siblings – much like the plot of our television shows. I didn’t opt for it finally, but before watching this weeks’ Wrath of the Titans I thought I should read up a bit on Greek Mythology, so my movie watching experience could be devoid of questions. Sequel to 2010’s Clash of the Titans, Wrath of the Titans isn’t an intriguing celebration of Greek mythology laced with universal morals that are passed down for generations. Maybe I was being too wishful to believe so, but I was proven wrong with this watered down version of a mash between Transformers and Immortals. The film begins with demi-god, Persues (Sam Washington) and his humble life as a fisherman. He is visited by Zeus (played by Laim Neeson) who informs him that the gods are losing their Godliness to the Humans and a dangerous war is brewing. Together, Zeus, Hades (Ralph Fiennes) and Posiedon (Danny Huston) had overthrown Persues’ evil father Kronos, but now they must strike a deal with him to regain power and remain immortal. While each brother is battling it out to gain autonomy, Persues’, being the hero (and yes, there is no built up to why he was chosen in the first place) must save the human-race. 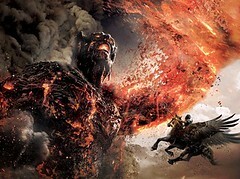 Wrath of the Titans lacks a sense of story and structure. For a sequel, it assumes the viewer has seen the previous film and is well-versed with the small nitty-gritty’s of every character’s history. It’s like expecting to remember your relatives’ middle names and how they are remotely related to you. Before you can clear your doubt, a monster pops up on the screen: between three-headed made-up animals and a puffed up man-buffulo, you’re expecting pretty much anything to pop up on screen as a “threat”. The CG team is the real winner here. There’s no energy in the story-telling. When you revisit an older era, where the culture, habits and look is starkly different, the representation is usually one of awe and passion. Passion to bring out a world that we have only read of in books and more importantly a passion to tell a story based in that world. Wrath of the Titans looked more like a videogame to me – with no enthusiasm in the performances (a waste of the talented Ralph Fiennes), confused sense of structure and an overkill of visual effects. I strongly recommend you miss this one. Yup, I am! I was trying to bring in some sarcasm :) Clearly I need lessons in that, haha!